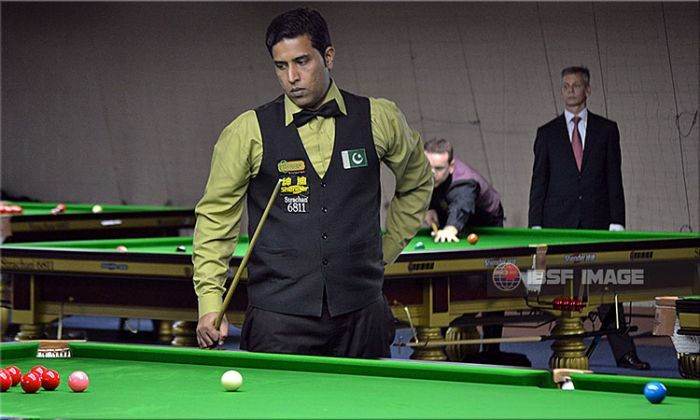 Breaks does not win matches and the same happened last night during the match between Ryan Thomerson and former World Champion Muhammad Asif of Pakistan. The high voltage match began with a crackling break of 140 points by Ryan Thomerson in the opening frame to put Asif under tremendous pressure from the start itself. And yes, that must have made an impact as Asif stayed more alert after that. He charged up himself in the next frame and posted a small but an effective break of 51 points to pull off the frame that went very close and ended with 8 points difference. Even though the third frame also had the same story and the margin goes down to 7 in favour of Asif. However, Ryan applied the more strategies to dig out fourth frame but Asif wouldn’t be interested to let the proceedings go like that and he posted a century break in fifth frame to control the situation better. After getting his rhythm back, Asif posted another break of 78 to shut the doors for Ryan further in the competition. Meanwhile the defending champion, Pankaj Advani also won his match 4-0 posting 126 points clearance in the last frame. He defeated Sean Corkish of Isle of Man and all the frame remained one-sided scoring. Though there were some disappointments as all the players from the host nation Qatar falters in the last-64 stage and out from the competition. However, Ahmed Saif performed really well and stretched the match till the deciding frame. In fact, he faced three breaks of 52, 89 and 72 in the initial frames but he stayed composed and pull back couple of frames against Welshman Andrew Pagett. But his all the efforts went in vain as Andrew held his nerve better in the decider and sealed the frame 72 against 43 to win 4-3.